The elegantly conceived and exquisitely machined CMA400i has four Class A circuits designed to drive any headphone. Dip switches under the chassis offer gain control to manage different types of headphones. The 440i has a 4-PIN balanced XLR output 2.5mm headphone jack and a 6.35mm standard headphone jack. For the review, I used the 4 Pin XLR Balanced headphone jack exclusively. I'll leave describing the loveliness of the Audeze LCD-3's performance for the upcoming review. I left the four dip switches on the 440i's bottom plate in their 'standard' position. Suffice it to say, the pair was in perfect harmony. 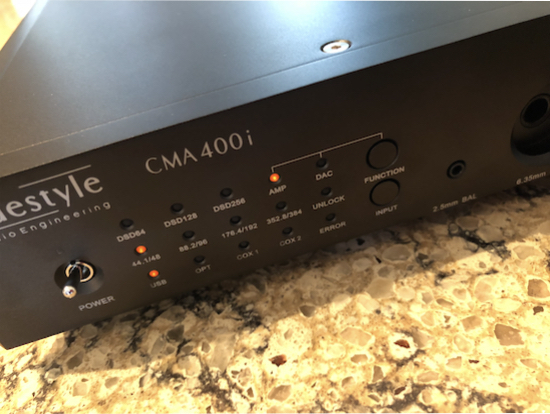 The CMA440i takes the signal from the source and, like the Mytek described earlier, covers it in glory. The glory is in the dynamic range, which is large, and the exceptional delivery of micro and macro dynamics. As such, low level detail is nothing short of astonishing.